As you may know event handlers are a common source of memory leaks caused by the persistence of objects that are not used anymore, and you may think should have been collected, but are not, and for good reason. Before diving into the core of the article let’s review two items which are used extensively in the code: a class and a method. For those who wonder what the strange empty delegate initialization is: it’s a trick to be sure the event is always initialized, without having to check each time if it’s non-null before using it. In .Net the garbage collection is triggered in a non-deterministic manner, which is not good for our tests that need to track the state of objects in a deterministic manner. second GC.Collect() ensures the newly finalized objects are swept too. So first thing first, let’s try to understand what’s the problem with event listeners, with the help of some theory and, most importantly, a demo. 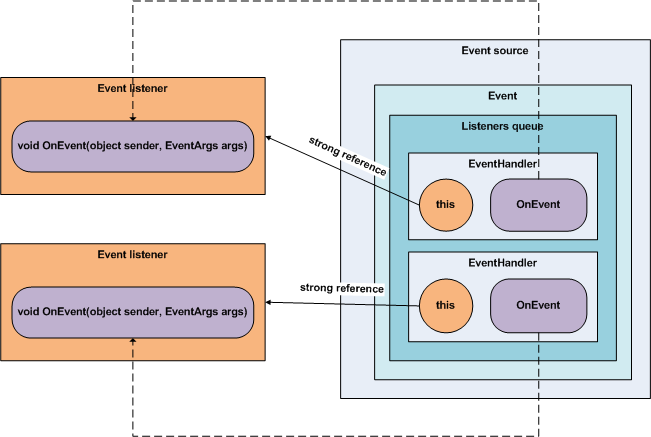 When an object acting as an event listener registers one of its instance methods as an event handler on an object that produces events (the event source), the event source must keep a reference to the event listener object in order to raise the event in the context of this listener. This is fair enough, but if this reference is a strong reference then the listener acts as a dependency of the event source and can’t be garbage-collected even if the last object referencing it is the event source. This is not an issue if you can control the life time of the listener object as you can unsubscribe from the event source when you don’t need the listener anymore, typically using the disposable pattern. But if you can’t identify a single point of responsibility for the life time of the listener then you can’t dispose of it in a deterministic manner and you have to rely on the garbage collection process … which will never consider your object as ready for collection as long as the event source is alive! Theory is all good but let’s see the issue with real code. “EventListener received event.“: this is the consequence of our call to “source.Raise()”; perfect, seems like we’re listening. “Setting listener to null.“: we nullify the reference that the current local context holds to the event listener object, which should allow garbage collection of the listener. “Starting GC.“: garbage collection starts. “EventListener received event.“: this is confirmed by the second call to “source.Raise()”, the listener is still alive! “Setting source to null.“: we nullify the reference to the event source object. “Starting GC.“: the second garbage collection starts. “NaiveEventListener finalized.“: this time our naive listener is collected, better late than never. “GC finished.“: the second garbage collection ends. Conclusion: indeed there is an hidden strong reference to the listener which prevents the event listener to be collected as long as the event source is not collected! Hopefully there is a standard solution for this issue: the event source can reference the listener through a weak reference, which won’t prevent collection of the listener even if the source is still alive. And there is a standard pattern and its implementation in the .Net framework: the weak event pattern. 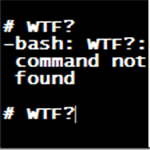 So let’s see how we can tackle the issue in the .Net framework. So this is a two step process. Nice, it works, our event listener object is now correctly finalized during the first GC though the event source object is still alive, no more leak. But this is quite a bunch of code to write for a simple listener, imagine you have dozens of such listeners, you’d have to write a new weak event manager for each type! If you are fluent with code refactoring and generics you may have found a clever way of refactoring all this common code. Before .Net 4.5 you had to implement this clever weak event manager yourself, but now .Net provides a standard solution for this issue, and we’ll review it right now! .Net 4.5 has introduced a new generic version of the legacy WeakEventManager: WeakEventManager<TEventSource, TEventArgs>. Thanks to a good use of .Net generics the WeakEventManager<TEventSource, TEventArgs> handles genericity itself, without us having to reimplement a new manager for each event source. There is only a single line of code to write, really clean. As expected the behavior is the same as the legacy event manager, what more could we ask for?! As you’ve seen implementing the weak event pattern in .Net is quite straightforward, particularly with .Net 4.5. If you’re not using .Net 4.5, as the implementation requires some boilerplate code, you may be tempted to not use this pattern and instead directly use the C# language facilities (+= and -=), and see if you have any memory issue, and only if you notice some leaks then make the necessary effort of implementing it. But with .Net 4.5, as it’s almost free, the plumbing code being managed by the framework, you can really use it in the first place, though it’s a little less cool than the C# syntax “+=” and “-=” but semantics is equally clear, and this is what matters. I’ve done my best to be technically accurate and avoid any spelling errors but if you catch any typo or mistake, have some issue with the code or have additional questions feel free to let a comment. To make it short I'm an IT trainer specialized in the .Net ecosystem (framework, C#, WPF, Excel addins...). I like to learn new things, particularly to understand what happens under the hood, and I do my best to share my humble knowledge with others by direct teaching, by posting articles on my blog (pragmateek.com), or by answering questions on forums. I have a few hundred thousand listeners and want to implement the WeakEvent pattern. However, even after implementing it, it seems the only way to release the listener is to call TriggerGC(), which is quite a degradation on performance. If I leave the TrggerGC() until the very end (after I'm finished with all my listeners), then the WeakEvent pattern doesn't do much; all the thousands of listeners still keep receiving events (which also result in a fairly costly exercise - recalculating a lot of values) and they're released only at the very end. Maybe this is just an effect of .NET garbage collection which I don't fully understand yet, but I'd appreciate some tips in this regard. Indeed the goal of the weak event pattern is to avoid preventing the collection of some objects. But it's only useful when a collection occurs. It is only a memory management tool. And in .Net the GC decides when it should occur by analyzing the memory footprint. So if you have millions of small objects consuming 100% of the CPU the GC won't notice them if they consume little memory. You should manually unregister your listeners from the listened objects, or disable them. They will stay in memory but won't do anything anymore. Maybe you could tell us more about your use case so that we could find the best solution for this issue. According to this post on StackOverflow (c# - WeakEventManager&lt;TEventSource, TEventArgs&gt; and PropertyChangedEventManager causes memory leak - Stack Overflow[^]) WeakEventManager<,> is broken and lead to small memory leaks too. Indeed really interesting, thanks for the pointer. Hopefully it will be fixed ASAP. Thank you, it helped me a lot! Very easy to readu and understand. Very good explanations with juxtaposition. Thanks for your feedback noshirwan, really appreciated. When do I call WeakEventManager<TEventSource, TEventArgs>.RemoveHandler(...)? If I never call RemoveHandler, will the event source maintain a weak reference to me for the rest of its lifetime? Even if that doesn't keep my object alive, it would be bad for the event source. And if I have a good, reliable place to call RemoveHandler, why can't I just use strong events? Re: When do I call WeakEventManager<TEventSource, TEventArgs>.RemoveHandler(...)? Yes the event source will maintain a weak reference but that's not an issue. When the listener does not want to listen anymore then it can unsubscribe. If you have a deterministic way of unsubscribing then yes you don't need weak events. Of course this is not an issue to never unsubscribe if your listener has the same lifetime as the application. EventSource does not have Event Property? when I try the test, there comes a wrong message "EventSource does not have event prooerty "!Why ? Re: EventSource does not have Event Property? the code should work perfectly, I've just retested the archive because you've made me feel uncertain and all is OK. I think you have a conflict with another class like the System.Diagnostics.Tracing.EventSource class[^]. Could you check this please? Actually,I thinked about the reason. but,the url of the source is not available from my environment. Not available? What's your "environment"? If you can't download the source code then you'll have to copy-paste from the article itself. I think all the code I've used is available inside the code samples blocks. Hope it'll work for you. I'm also not seeing EventSource.Event. This is probably the same issue as above: a conflict between the EventSource class of the sample and the EventSource class provided by Microsoft.Diagnostics.Tracing. Try to reference the first one using global::EventSource.